"Theodist Business Development Manager Ryan Pini when making the presentation today said Theodist is happy to give back tothe community especially to the street kids." 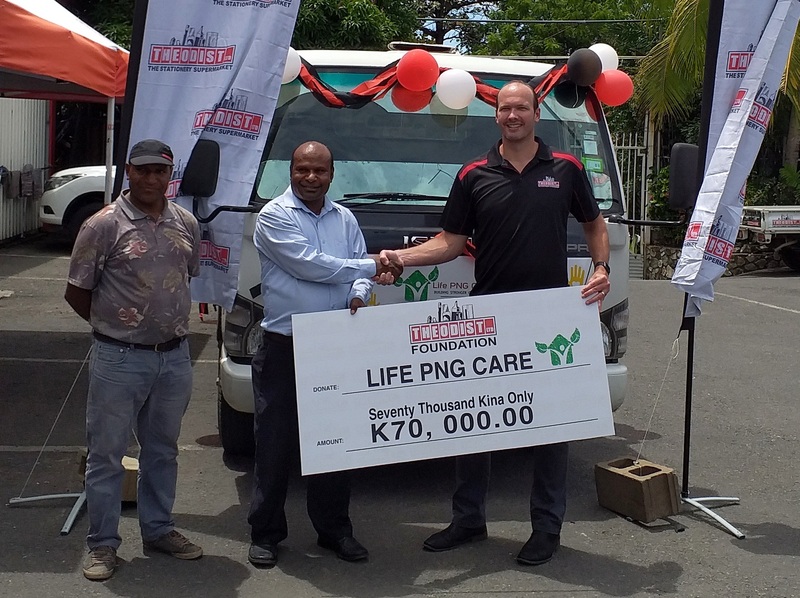 Life Care PNG is a proud recipient of K70, 000, a truck and school materials thanks to the Theodist Foundation. Theodist Business Development Manager Ryan Pini when making the presentation today said Theodist is happy to give back tothe community especially to the street kids. PNG Life Care National Director Collin Pake Yakio said their prayers for a truck is now answered after 3 years of struggling to bring in fresh produce from their farm in the Central Province. “We feed 150 children every weekend, mineral resources and other resources is of no significant without Human Resource, saidMr Yako. He stressed this when noting the donations of school materials. “Theodist’s donation of school materials to PNG Life Care will truly go a long way because it will benefit about 300 street kids who are currently enrolled in schools by PNG Life Care”said Yakio. Mr Yakio said under their Strongim Pikinini Program they have enrolled 300 unfortunate street kids in school, because they believe in giving these kids a better future. “What PNG Life Care do is, we always value and treasure these unfortunate children on the streets,” said Mr Yakio. “We provide a safe home and we make them to be someone better in the future,” he said. “We are so privilege and thankful that Theodist through their foundation have seen the work and efforts we’ve put for the last 12 years”, he said.